Contents: Introduction: mobilizing gender, race, and nation, Kevin Hutchings and Julia M. Wright; Part 1 Transatlantic Mobility: Gender and Sexuality: Charlotte Smith and the spectre of America, Jared Richman; Romantic aesthetics, gender, and transatlantic travel in Anna Brownwell Jameson's Winter Studies and Summer Rambles in Canada, Charity Matthews; Felicia Hemans, Herman Melville and the queer Atlantic, Daniel Hannah. 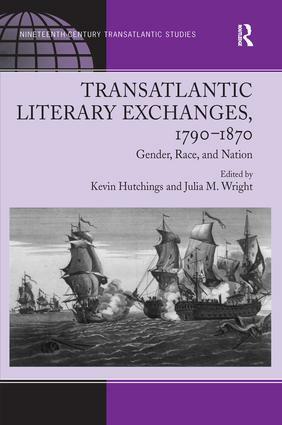 Part 2 Reconfiguring Race: Prophets of resistance: Native American shamans and anglophone writers, Tim Fulford; Frederick Douglass and transatlantic echoes of 'the color line', Bridget Bennett; Pirates and patriots: citizenship, race and the transatlantic adventure novel, Sarah H. Ficke. Part 3 Cultural Exchanges: Print, Tourism, and Politics: Charles Brockden Brown and England: of genres, the Minerva Press, and the early republican reprint trade, Eve Tavor Bannet; Romantic Niagara: environmental aesthetics, indigenous culture, and transatlantic tourism, 1794-1850, Kevin Hutchings; Beyond the American empire: Charles Brockden Brown and the making of a new global economic order, Wil Verhoeven; Bibliography; Index. Kevin Hutchings is Professor of English and Canada Research Chair in Literature, Culture, and Environmental Studies at the University of Northern British Columbia, and Julia M. Wright is Associate Professor of English and Canada Research Chair in European Studies at Dalhousie University.